While you can run PCLinuxOS on Slackware, OpenSUSE, Fedora, Ubuntu, or any other Linux you wish, You can also run any Linux distribution on PCLinuxOS, using VirtualBox and/or QEMU. I mentioned VirtualBox as it does the best job of utilizing network and hardware resources between Linux distributions. QEMU is a good virtual machine for running older Linux distributions, Windows 9x/ME, PC/MS-DOS (with and without Windows 3.x), FreeDOS with OpenGEM, MikeOS (created by Mike Saunders of Linux Format fame) and other operating systems that run on Intel x86 processors (as well as the AMD equivalents). As an Intel emulator, QEMU emulates a x86 machine with a Cirrus 34xx video chipset for video, your choice of an Adlib, Sound Blaster 16, or ESS1860 for audio, NE2000 Ethernet emulation, with TUN capability for networking, virtual serial and parallel ports, which can be redirected to disk files (for later printing), or to actual devices such as a USB Modem (for serial port access) or a USB printer (for the parallel port). This software package emulates a IBM System 370, System 390, or a z-Series mainframe. You can use this to see how Linux runs on an IBM mainframe. However, to understand how Hercules works, you need to understand how to install and maintain these classic IBM mainframes. You will need to have the Hercules package installed, a 3270 terminal emulator, and some packages containing the operating system, and supporting software packages. Fortunately, the Hercules website has links to sites for downloading of these packages. This is Google's newest platform for smart phone development. You start by downloading the basic SDK to an empty directory on your hard drive. While you are still connected, unpack the archive and run ./tools/android to launch the system manager. You can use any development environment such as Eclipse, KDevelop or Anjuta, or even use a text editor such as Emacs for Android development. Within the system manager, you can install development packages, including API, toolkits, and documentation. You can also create virtual Android devices to test your applications you create before deploying them to smart phones. Most of the development for Android takes place on the command line, or through your favorite development environment. 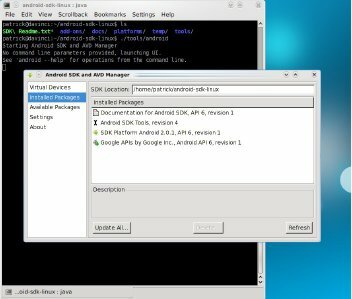 In this example, I have the latest versions of the Android SDK tools, the SDK Platform, and the application APIs from Google installed. I also have a virtual smart phone with the latest Android (version 2.0.1 as of this writing) installed. It is here where I have a virtual Motorola Droid phone (as advertised by Verizon Wireless) installed. Note: To create virtual Android phones and to download the installed packages, you must be connected to the Internet as the tools are downloaded directly from Google servers. Note that these options can also be accessed through the user interface that launches when ­­ help is not provided on the command line. Unfortunately, the same could not be said for development for the iPhone. Just learning Objective­C is not enough. According to the Apple website, you need to have registered your iPhone (that is, you must own an iPhone, not just download the simulator) to develop applications for the iPhone. Registration allows you to obtain a user account for which you login to download the SDK. Also, you must be running Mac OS­X to download the SDK. However, Jonathan Zdziarski has written a book called iPhone Open Application Development that allows you to work around the SDK restrictions. The link on this page allows you to order the book from Amazon.com, and is provided for your convenience. While we have emulators such as VirtualBox and QEMU to run other operating systems, the future of computing is clearly moving in the direction of mobile devices. While PCLinuxOS can run on the current generation of netbooks, and more traditional laptops (of which I recommend the latter for everyday use), it is the smart phone where there is a substantial growth in applications development. Besides Android (which is itself a Linux derivative, and requires Linux for development) and iPhone (as you would guess is a Mac OS­X derivative), we have the next generation Palm devices, which do not resemble the PalmOS devices of yesteryear as far as functionality and usability. The good news here is that the current generation of Palm devices are Linux based! Hence, the older PalmOS tools, such as KPilot and Gnome­Pilot, are not needed. Instead, you can use the Bluetooth capabilities to sync these devices.